The recenlty deployed version of AC for Web Pro marks the fist milestone of what will be known as AC for Web Pro 2. Redesigned user interface. True to its vision, AC for Web Pro became more like your regular desktop application. The newly introduced menu bar is the central access point for features and functions that used to be scattered around the header, footer, and various pages and sections. You should find the new interface very intuitive and a new video walkthrough will be available soon. Export and import functions allow you to backup and restore your data, switch to a different Google account, or move in and out of ActionComplete. You can export either all or just visible tasks (scope: All or Visible) and choose the type of tasks to export (type: All, Actions, Waits, Projects, Pending). 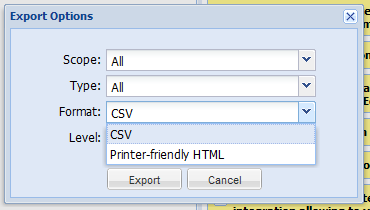 Currently the only export format is CSV (comma-separated values). You can open the CSV file exported out of AC for Web Pro with Microsoft Excel, upload it to Google Spreadsheets, or use a text editor of your choice to view and edit the file. AC for Web user manual will be updated with the details of the exported file format shortly. A custom internationalization framework was built from ground up to bypass the limitations of underlying technologies and frameworks. Now AC for Web Pro can be translated into as many languages as desired. If you are interested in participating in ActionComplete internationalization please email the support. To get all the goodness described above - if you are an AC for Web Pro user that is - the only thing you need to do is to refresh your browser window. Here's a teaser. More screenshots are available at ActionComplete Facebook page.